Bali is hot, and we also have a few hot days each summer here in Halifax. 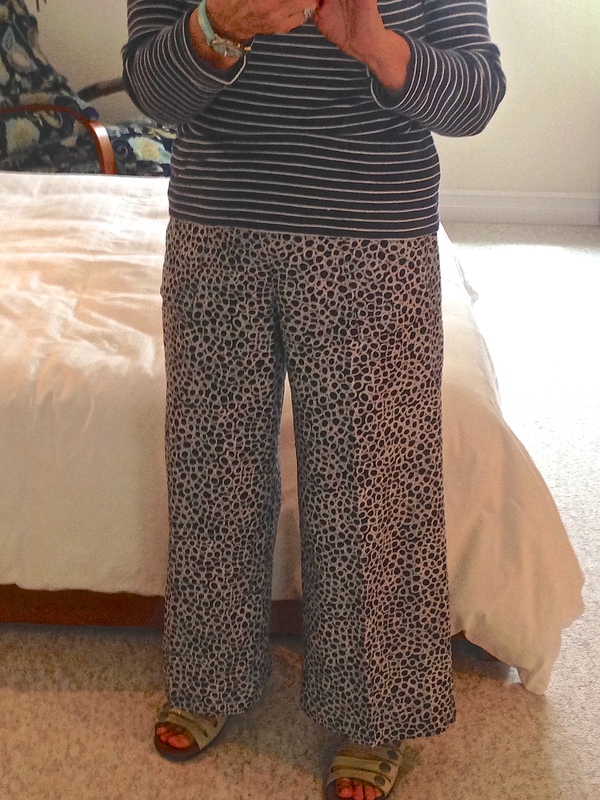 So I decided to make a pair of palazzo pants — loose fitting pants with a yoke that sits just below the waist. This is the first pair — I used some of the katagami (Japanese batik) I bought several weeks ago. I’ve used this fabric in a couple of quilts (I backed one with it). It washes well, presses nicely and drapes softly. The pattern I used didn’t have pockets (I added two on the front – deep enough to carry my phone in my pocket), and it had a side zipper. This pair I put in the side zipper with an added tab (with a button) at the top. I’ve made a white and a navy pair – each with a fly-front which I prefer to a side zipper. I’ve got two more pair cut out – I think at least one of them I will cut off to a capri length. Definitely comfortable. They’re not all for Bali (I’ll probably only take a single pair), but they’re great to wear in our weather which has been warm and humid for the last couple of weeks.